Plasan Carbon Composites had a problem. Located in small-town Bennington, Vermont, Plasan designs and producs OEM (original equipment manufacturer) body parts for vehicles. The firm is well known for its use of carbon fibre as a building material. Plasan (originally called Vermont Composites Inc) was sending off a carbon-fibre fender for a General Motors Z06 Corvette to an outside custom coater to be primed. The custom coater was not doing a very good job, however. The vendor was inefficient, operating in decidedly low-tech fashion: “They were literally pushing these parts around on carts on the floor,” recalls Bob Davis, corporate paint engineer at PlasanUSA. The paint system had to include an automated conveyor—a piece of equipment the custom coater lacked. There was another reason for wanting a conveyor: “As part of the standard for making their parts, GM prefers that parts are not touched by workers during the painting process. The obvious solution for this is to use a conveyor to take the parts throughout the various steps in that process,” explains Marc Seward, general manager, Industrial Division for Bloomfield, Connecticut based Managed Air Systems. Managed Air would serve as the “systems integrator”—figuring out what components Plasan needed, sourcing these components, then overseeing installation. Seward worked as point man on the project. In September 2006, the automotive wing of Vermont Composites was purchased by an Israeli firm called Plasan Sasa, and adopted the PlasanUSA tag. Around the same time, PlasanUSA started working closely with Managed Air. Plasan provided tech specs and Managed Air set about locating appropriate suppliers. 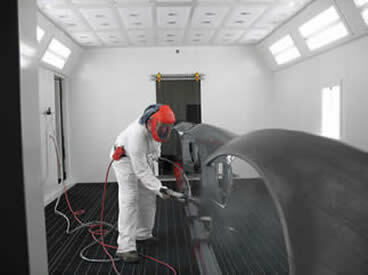 Plasan wanted a system that could paint a variety of parts, not just fenders. They had some design ideas as well. This fact came to light when Plasan ran a series of simulated tests using CAD drawings. The computer tests indicated that large auto parts would have massive wobble on a standard conveyor. Space constraints in the area designated for the conveyor at Plasan’s plant limited Managed Air’s options. Seward contacted a Mississauga, Ontario manufacturer he had worked with in the past, called Pacline Overhead Conveyors. He explained his situation to Dan Hirschorn, a project engineer at Pacline, who came up with a solution. Automotive parts move on Pacine’s inverted PAC-MAX™ conveyor as a paint finisher applies coatings. Pacline built the conveyor, while Eaton Fabricating of Grafton, Ohio, made the washer and ovens. The downdraft spray booth was manufactured by Global Finishing Solutions, Osseo, Wisconsin, (in Canada, Global is based in Barrie, Ontario) while Graco, Minneapolis, Minnesota, made the electronic proportioner. Becca, from Kennesaw, Georgia, manufactured the gun washer and solvent reclaim system while National Partitions of Knoxville, Tennessee built a wall that was used in the system. The conveyor itself didn’t feature a belt, but rather a 420-foot chain as well as a modular track and bolted design. The belt-less conveyor was “packaged in crates, shipped in crates” and put together at Plasan’s facility, says Hirschorn. Assembly of the paint system began in May 2007. The conveyor was laid out so it formed a U-shape in a space measuring 49 ft. by 71 ft. 7 in. according to Seward. “We had many curves and corners—that was part of the unique aspect of the project,” he says. Because the conveyor boasted a bolted design, welding was not required for assembly. Construction, says Hirschorn, was “like putting together a big Meccano set.” The conveyor was mounted on pedestals on the floor and turned on its side, as per Hirschorn’s recommendation. “The installation was super easy, because all the components were modular and brought in, fit in place and connected in a very short time,” adds Davis. Once the design issue was sorted out, Managed Air went to work getting the major components in order. These included “the conveyor, four-stage washer, dry-off oven, down-draft spray booth and cure oven,” states Seward. The original finish date was the first week of June 2007. “The system was functioning the week prior to that, but we didn’t sign off on the function until the 6th of June because we like to run the equipment for a period of time to make sure it is reliable,” says Davis. “We had a photo session and a little ceremony when we ran the first part around the conveyor—nothing fancy. No confetti,” he laughs. So far, Plasan has been delighted with the conveyor: “The main features that I like about it, there is no surge, no variation in conveyor speed. Because the system is robust, somewhat overbuilt, we have a lot of stability and line speed and part position,” says Davis. Aside from the actual paint spraying (which is done manually), the conveyor works automatically. Davis has no major mechanical problems to report aside from some fine-tuning here and there. In fact, the PAC-MAX™ had boosted Plasan’s corporate profile. Seward pegs the total budget for the project at around $1 million. Davis has no details about “profit and loss per se” but believes the conveyor has been a boon to the bottom line. For one thing, Plasan no longer has to rely on an army of workers toting pushcarts to do the painting. Production is set to increase, however: with new GM contracts in hand, Plasan will be doing “over 1,000 parts a week by the end of April. Probably be 1,400 by the end of the summer,” he says. An admirable target for a successful project Davis describes as “a lot of fun” for everyone involved. Nate Hendley is a freelance writer based in Toronto.